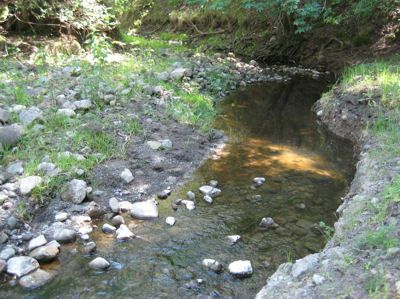 There are several parts of a creek: the water flowing in it, the creek bed, and the banks. In addition to the creek itself, there's vegetation in the water, on the banks, and on the uplands immediately beyond the top of the banks. Finally, there are the animals that use the habitat. This whole assemblage is called a riparian corridor. 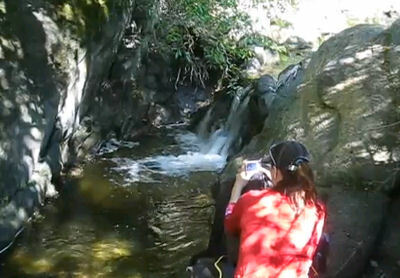 Scientists have identified seven types of water flow in creeks. Different types of flow provide different habitats for aquatic creatures. Some use a variety of habitats for different purposes. Others are adapted to a particular type and never leave it. Fast, slow, shallow, and deep are all relative terms. Deep is usually defined as at least half a meter. A small creek may not have any water that deep, but it probably does have spots that are deep enough to fulfill many of the functions of that habitat. Falls and cascades occur where there are rapid changes in elevation, and rapids where there is constriction of the channel. 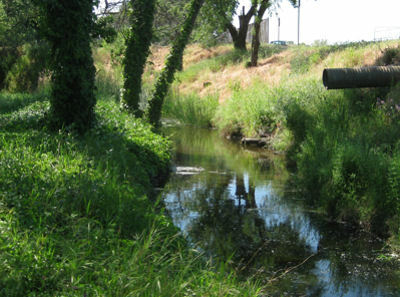 Many sample locations in Contra Costa County have little or none of these three types of flow. Falls, cascades, rapids, and riffles are important for creek health because they oxygenate the water. A healthy creek has all of the last four types of flow – riffles, runs, glides, and pools. Absence of riffles has a bigger impact on creek health than absence of one of the other types. A variety of flow types is important for the usual reason – it creates a variety of habitats which in turn promote greater biodiversity. Bedrock is a special case of solid rock under a creek. In addition, any of these substrates can be covered by leaf litter and other organic debris, creating yet another habitat niche. Still under construction 5/09 – more to come. It's hard to tell how deep a pool is just by looking.